These re-usable Best Bottom Training Pants have both the look and feel of real underwear and are easy for little ones to pull up and down. To help catch those early potty training accidents, they include interior snaps for our small all-in-two inserts! Combining these fantastic Best Bottom Training Pants with our microfiber all-in-two inserts is a match made in heaven. Our microfiber inserts do a great job catching those unpredictable leaks on the way to the potty but also leave enough moisture so kiddos know that they are wet and that it is time for a change. These training pants are wonderfully reusable, as well! These Best Bottom Training Pants are available for purchase only. They are on sale for $12.50/pant for a limited time only! The suggested retail price is $13.95. For potty training, we recommend having 3-5 pants on hand. And, don’t forget to ask us about our special potty training rate for those combining these training pants with our small size premium all-in-two inserts. 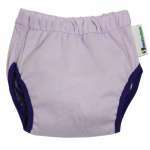 Potty training with Best Bottom Training Pants and our small All-in-Two Inserts is a snap! Simply snap a small insert into the interior of the training pant, and pull it up. 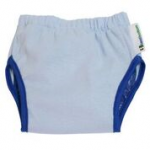 When purchasing Best Bottom Training Pants to use with our Premium All-in-Two Diaper Service, you will provide care for your Best Bottom Training Pants at home. Best Bottom Training Pants have wipe-able interiors, so light cleaning can be easily done with a baby wipe. These training pants may be used multiple times before machine-washing, but should be placed into the laundry if they become soiled.